EDWARDSVILLE – Alton senior baseball outfielder Robby Taul had a leadoff triple to start the Redbirds season opener in the Prep Baseball Report Metro-East Kickoff Classic game at Roy E. Lee Field at the Simmons Baseball Complex at SIU-Edwardsville on Thursday night. 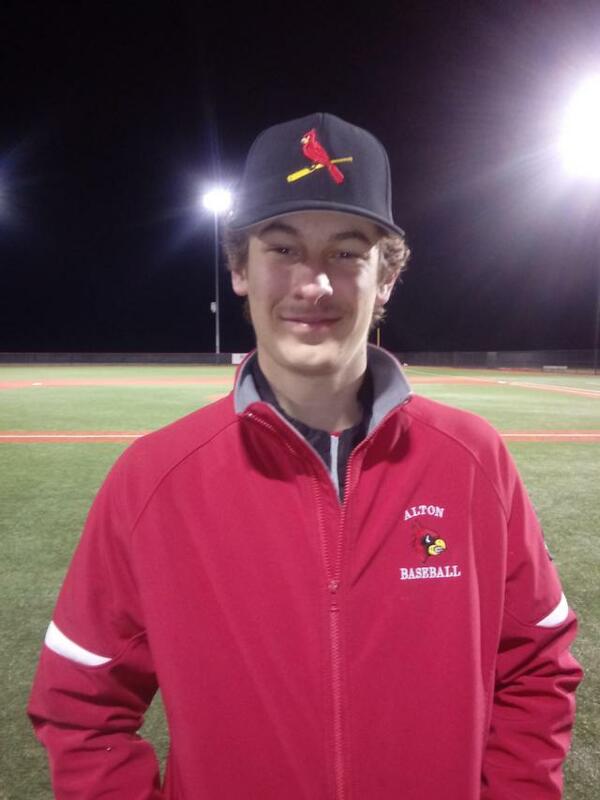 Unfortunately, it was only one of two hits the Redbirds had as Alton lost to Chatham Glenwood 13-0 in a game called after four-and-a-half innings because of the 10-run rule. Still, Taul knows that baseball is a long season, and there are more games ahead to do positive things. It’s one of the more beautiful things about baseball. There’s always an opportunity to bounce back and improve during the long season. Taul sees himself as a positive energy kind of player, who’s always encouraging his teammates and keeping things going on an even keel, even when things aren’t going well. One of Taul’s biggest goals for the 2019 season is to win an IHSA Class 4A regional, something he’s never done in his time with the Redbirds. For the team, it’s a very simple goal.